My love affair started with Italy 10 years ago. My love for food started as soon as I could say spoon. For those of you new to my blog, it is called “curious appetite” because I wanted to write about all the things I was curious about: food, places, drinks, cultures and such. If something is unique, I want to order it. If I see something new and/or seasonal in the market, I want to cook it. Like finding fiori di zucca/zucchini flowers. I’ll try anything at least once. Seize the day- there are millions of flavors out there in the world waiting to be loved and loathed! One of the intentions of my blog too was to write about restaurants I was curious about. I wanted to write about places that did something different and with grit. And to give my humble opinion about eateries that were on everyone’s lips and yelping finger tips. So here it is- a mix of experimenting in the kitchen and at eateries around the world, mostly the US and in Europe. I love the food culture in Florence and I love the Sant’Ambrogio Market. I’m pretty sure that everyone who follows my blog knows this by now, and especially the purveyors there who I ask many questions to. One of my trusty veg guys (who is also a farmer, which is getting more rare these days in Italian food markets) has the some of the most gorgeous zucchini flowers in the world. I couldn’t resist them. I thought about frying them but then decided to do something a little healthier, like a frittata. I didn’t want to follow a recipe, but instead wanted to experiment with what was lying around. There present: leek, zucchini and sheep’s milk ricotta. In my spice cabinet, I had some paprika that I thought would make this a little more interesting. It turned out easy, simple and delicious. I recommend anyone make it if they are dealing with an abundance of zucchini flowers in their garden or see them in the market and not sure exactly what to do with them. In a quality, non-stick pan (and not teflon, make sure your cookware is non-toxic.) melt a tiny knob butter (just enough to coat the pan) and drizzle some olive oil. I love mixing butter and olive oil for eggs but you can just use olive oil. Add sliced leeks and cook until softened. Add the tiny chopped garlic clove and melange together for a minute. Lay down the sliced zucchini and cook until slightly softened (usually 3 minutes) on medium heat. 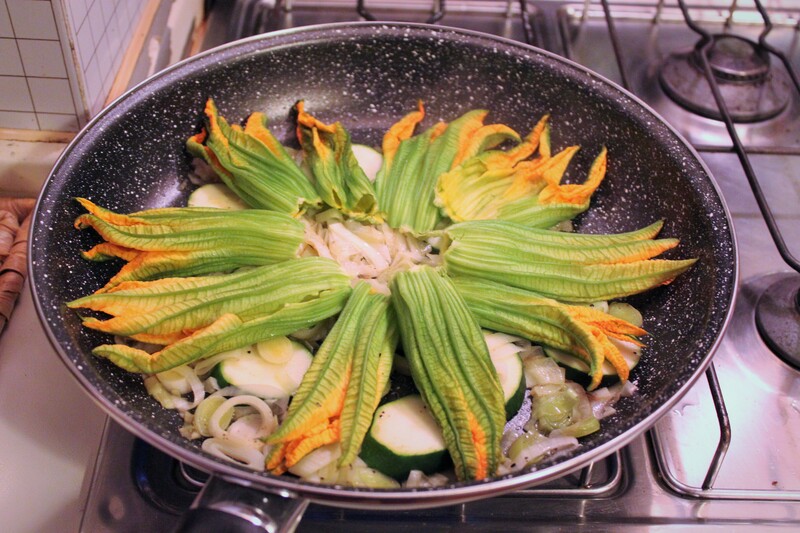 Then, add/lay down the zucchini flowers in a sort of floral fashion- like a sunflower! 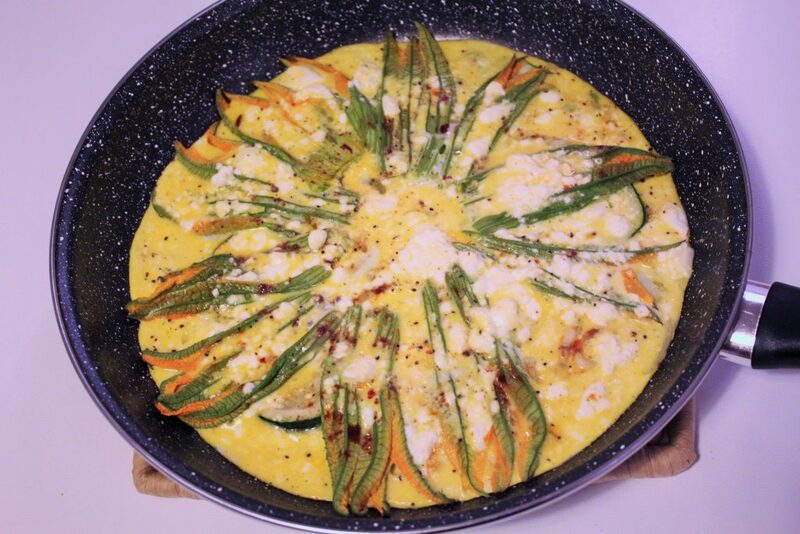 Get a pinch of paprika and hand sprinkle it on top of this veggie “pan-cake.” Let cook while you prepare the egg mixture. Crack 4 eggs into a bowl. Spoon in ricotta. Whip all together with a fork until somewhat uniform, trying to work out most of the clumps. Add fresh ground pepper. Pour egg/ricotta mixture into the pan. Let cook for a minute then: turn down heat to low and cover for 5 minutes or until cooked. Peek inside every once in a while. I tried with a little crumble of fennel salami “sbriciolona” on top and the heat from the frittata melted the soft fennel spiced salami into a savory delight. To stay healthy though and not overwhelm your palate with too many flavors, keep the salami away! Some sea salt flakes should do the flavor boost trick if need be! 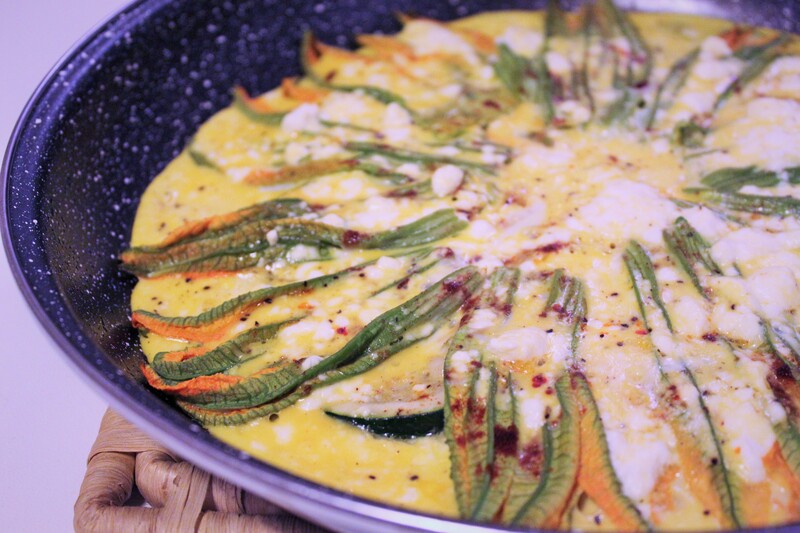 What are your favorite ways to enjoy zucchini flowers? Share your tips by leaving a comment! Did you know I lead gourmet market tours? Send me a note for more info and stay in touch by scrolling up and subscribing for future posts! For more culinary tips, follow on Instagram (@curiousappetite) and Facebook. Buon appetito! OMG, how i loved it when you made this for us. Definitely going to try this at home! Miss you, bella!